The boa knot is a modern, binding knot invented by weaver Peter Collingwood in 1996. His intention was to develop a knot that would hold well when the constricted object was cut close to the winds of the knot. The boa knot is related to the strangle knot and the double constrictor knot. It combines both the structure and qualities of these other two knots. 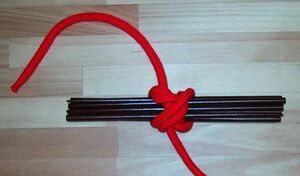 The boa knot is best used for securing objects in cylindrical loads. This page was last edited on 21 August 2007, at 14:09.